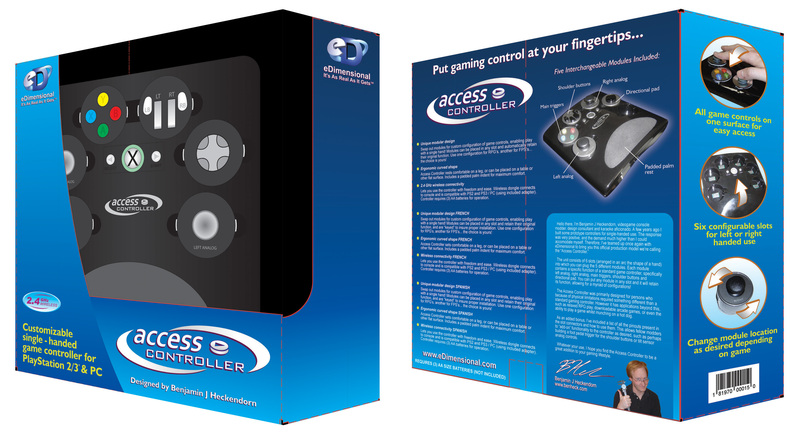 You can now pre-order the Access Controller! We’re finally close enough in production to start taking pre-orders for the Access Controller. Please click here to visit the eDimensional site and proceed. You’ll also notice a permanent link on the right side of the site that you can use, as well as one for my headset. The Access Controller is intended as a solution for those who have difficulty using a standard gaming pad because of a physical limitation or other factors. 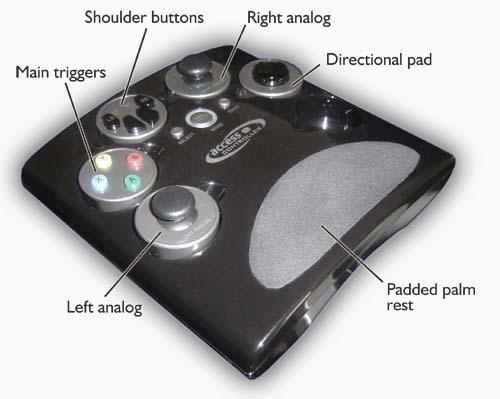 All of the gamepad controls are on one surface, allowing easy access, and the curved bottom and feet lets the user place the unit on their leg or flat surface, removing the issue of having to hold it. On top of this, each of the modules can be placed in any of the 6 slots in the unit, allowing a myriad of configurations to best suit the user and/or specific game. Description of the 5 modules, shown in a sample configuration. It has been a long process (a solid year) but I’m glad we’ve finally reached this point, and I’d like to offer my most sincere thanks to Michael Epstein at eDimensional for supporting this idea and bringing it to fruition. I absolutely honor you benjamin Heckendorn! Congradulatons on being the most succesfull hacker of all the years to pass and come! You need your own PBS channel! Or better yet, A place on G4! I was SO happy to finally see preorders available on Engadget, I rushed to the eDimensional website as I IM’ed all my buddies online to watch their @sses in about 8-10 weeks… until one of them pointed out to me [asI was halfeay through checkout, luckily] that THERE’S NO XBOX 360 COMPATIBILITY built in. When, oh when can I expect that???? It’s a rollercoaster of emotion I’ve been on the last couple minutes… please tell me 360 compatibility is coming…? Well done, Ben – you got there! I wish you and eDimensional every success with this – so maybe one day we’ll see more accessible controllers looking as polished as this one and getting released. Good man. Hope you’ve not lost your passion for building enabling devices – can’t wait to see what you come up with next. Alright Ben! Another official product and one designed for a good cause at that. I can’t wait to try one. That production model looks sweet man. The box info is amusing. Congrats. Look forward to seeing one in person some day. The Xbox 360 version is forthcoming… it just takes longer because of licensing and what not. That’s awesome, Ben. Really. Just fantastic. Your work just keeps getting more & more amazing & this is a tremendous step to aiding disabled gamers everywhere. Congratulations. i’ve placed my pre-order Ben, all the way from Ireland. Thank you for seeing this through, it means a lot. PHEW. Good to hear… I was figuring it was something with MS; I guessed it was the proprietary wireless signal they used or whatever- I was prepared to beg for a usb-enabled version for the 360 if that were the case. I’ll definitely be getting one of the 360 models; if not more than one, if they work out. I’de love to see ahalf hour or hour benheck show on G4…..maybe we should start a petition?? You know, I was thinking, we see videos of your projects in action all the time, Ben. Any chance you could make one using this controller? Assuming you have one of the production units. Ben , this is a wonderful thing you have made. I can see it being used with disabled people, who have lost either the mobility in one hand or etc. in that direction, and now they can play again with that one handed controller. I applaud you bigtime. Greetings from Denmark by the way. Nice. You must be proud to have a commercial product available to the masses. Hey Ben, when the Xbox 360 version will be available, will there be an “all-in-one” controller to work with all the systems, or will the 360 version be separate? I am very interested in this product because I was born with a malformed left hand and could learn to use this to play all the games I am forced to miss. I own both 360 and PS3 and it would be awesome to have 1 controller for each. Are the buttons and D-pad sticks easy to press? I remember buying some stuff from eDimensional years ago lol. I didn’t even think they were still in business. Seems I’ve missed a lot on their site. Your my hero! I am a new dad with a son who was born without a left had due to amniotic banding. The only gaming option I could think of for him was an upright arcade. This is great. May I suggest you promote this with http://www.amputee-coalition.org/ and maybe Early Intervention programs. Hey Ben, I’ve had some of your pics and info up on our site in our Case Mods page and think it’s great. We are currently looking at helping a young many (16yrs old) who has Cererbal Palsy very badly, but is going into this years City-=to-Surf race held in Sydney every year. He will be pushed by his dad, and we’re approaching him (dad) to see if we can help in some of the stages. The other side of it is, as all young men love games, I’d love Luke to have the same access to games as many of his able-bodied friends do, so I’m at MS to give us an Elite 360 to give to Luke, but we’d need an input device for him to use naturally. As you know, CP suffers have limited use of their arms etc, and so use their chin on the motorized chairs an the like. I once help a good friend set up a thing called Sailability, which helped CP suffers SAIL their own small bout on the foreshores of Sydney Harbour. These were controlled by the users chin and included rudder, sail tensioner, etc etc. Now I know something is possible, do you think your unit could help us bridge the gap, or do you hacve an idea how we might do this with the 360 in mind. This is awesome. I am so looking forward to buying one but I am going to have to hold off until the XBox360 is added to the supported list. Can’t afford to drop 140$ twice. But thank you ever so much for producing this amazing device! As a one handed gamer I never even looked at consoles but now….checking out the PS3. Thanks. this product will allow people to use the Access Controller with an xbox 360 if they do not want to wait for the xbox 360 compatible version. I wonder when the 360 version will be out. I’d rather wait for that version than get the Playstation version and use my Sniper Plus, since the Playstation version won’t have the XBox button. All I can say is thanks! My daughter has cerebral palsy and as a result she cannot use her right hand except as an assist. Her sisters love to play video games, until we got a Wii she was left out. Now she wants to play Guitar Hero and I stumbled across your site because of the strumming device you made. This control pad is a fantastic product and I wish you great commercial success with it. Might I suggest that you advertise it on Military.com There are many veterans who could use your product. Keep up the great work! Is the xbox 360 compatible version out yet?